The Farrah European sham is a woven diamond pucker fabric with a quiet grey and ivory leaf jacquard on the reverse. 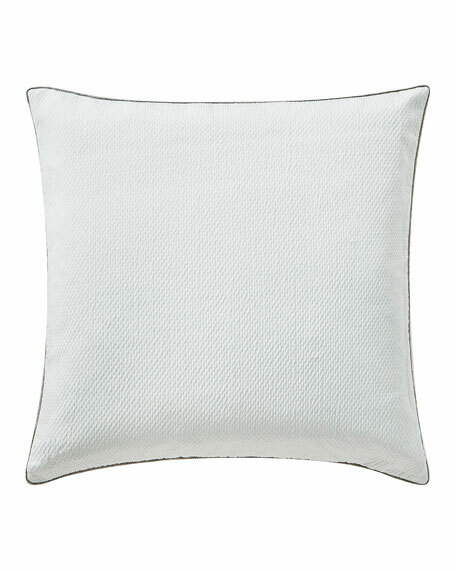 EXCLUSIVELY AT NEIMAN MARCUS Patterned sham with solid 2" mitered flange. Two-piece solid back. Hidden zip closure. Polyester/viscose. Dry clean. 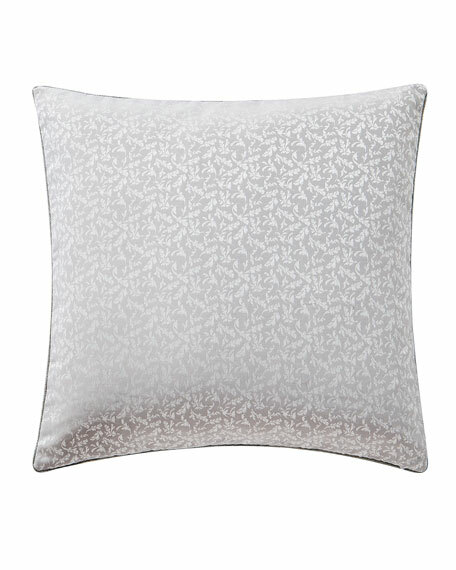 EXCLUSIVELY AT NEIMAN MARCUS Patterned sham with solid 2" mitered flange. Two-piece solid back. Hidden zip closure. Polyester/viscose. Dry clean. 26"Sq. Made in the USA of imported materials. EXCLUSIVELY AT NEIMAN MARCUS Tweed sham with brush fringe edge. Hidden zip closure. 25"Sq. Polyester. Dry clean. Made in the USA of imported materials. Sham in faille weave. 0.5" plain bound edge with mitered corners. Visible RL signature button closure. Cotton; machine wash. 26"Sq. Sham in faille weave. 0.5" plain bound edge with mitered corners. Visible RL signature button closure. Cotton; machine wash. 26"Sq. Imported. Textured solid linen sham. 1.5" stitch down tailored flange. 0.5" velvet binding on all sides. RL signature button closure. Polyester velvet tape. Machine wash. 26"Sq. Imported.